I want to say that we are having a blast in our new home. I want to say that it has been fun and we’ve been baking cookies and playing music while we blissfully find new homes for all of our old belongings. I promise, there have been some really fun moments. But honestly, this move has been brutal. We are going on week 2 with no laundry facilities, no dishwasher, and half the kitchen still in boxes because we are having cabinet work done. And that is where we are. It’s ugly, but there is progress. We have holes! This my friends, is the light at the end of the tunnel. I know we have a long way to go to get things the way we want them to look, but getting operational is priority #1. And it is so close I can taste it. I do love our new home and I know that in the long run these few weeks will be a blip on the radar. I am clinging to my glass half full and trying to sip slowly. In the meantime, we are still a family, and that is what truly matters. To Everything There Is A Season…. When it’s all done, you will love it. Now? Not so much. Hang in there!! I would go nuts without a proper kitchen!! How’s the little guy adjusting? I have so been there. We did a ton of construction before we moved in and then we had to move in while still under construction (I was 8 mo pregnant). Believe me when I tell you it will all be worth it and it will all be YOURS! Just keep thinking of the end result and how awesome your new home will be!! 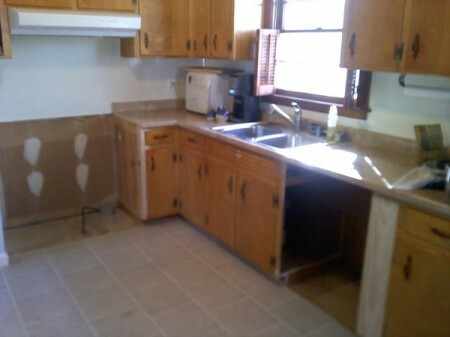 I have a friend who just did an entire kitchen remodel and she thought she was going to go insane. Turns out? She looks back on that time as a blip and is in love with house! It won’t take much longer! Can’t wait to see how it looks! So sorry to hear it is hard right now. I know I am not the most positive right now in my life, but remember, this too shall pass. Moving and house stuff is so stressful to me, hang in there. Call me if you ever need anything!